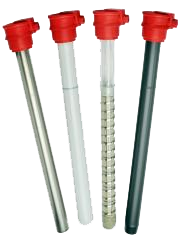 Our immersion heaters are manufactured to heat only liquids. 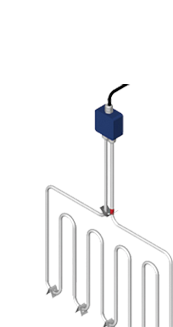 They are specially designed with a cable that only heats the part that is to be continually immersed. 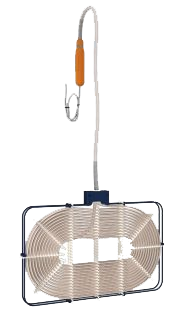 The cable is covered with a Teflon® coating. This plastic sheath enables the heaters to resist the flow of heat and the chemical attack of the bath. 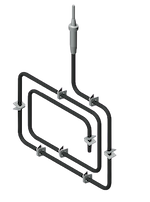 The heating segment comes in the form of a flat or cylindrical unit. It is followed by a non heating cable (called N) which must be covered by at least 20 cms of liquid. The two black marks on the N non heating cable indicate the minimum and the maximum level of solution. The connection pipe must be installed out of the tank and out of vapours. 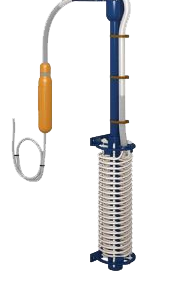 The N non heating cable can be flexible or rigid and lengthened. It is protected by an expandable PP braided sleeving. After the N part there is a tube called «connection pipe» in which we link our cable to a standard electric connection cable of type HO5 VV-F or HO7 RN-F according voltage and power (C part).